Last night I put the socks out of their misery: I pulled them out - the beauty of crochet. You can undo your mistakes so easily. 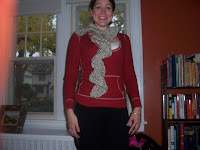 I think that's one thing that intimidates me about knitting; it's not so easy to get the bad stuff out of there. I was just getting some bad mojo from those socks. They were frightening in their gargantuan nature. I still have my pink/green sock yarn, and I may attempt another pattern, but for now the socks are at rest, and at peace. 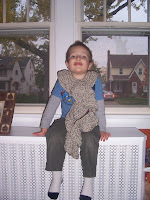 I got out the ugly kids yarn and embarked on Hank's mittens. 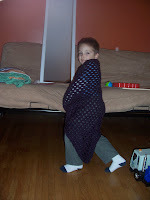 As soon as he spotted it, he went into another litany of his love for this yarn: "Mommy, it's so beautiful!!" He hugged it and squeeze it, giving it his blessing before it is transformed into warm mittens and a hat for him. 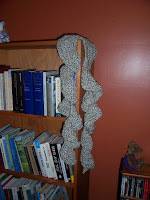 And the scarf doing it's own thing: This pattern is actually quite easy, and is free on Lion Brand Yarn's website. 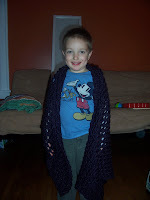 You have to sign up to access the pattern, but sign-up is also free. It's pretty cool. 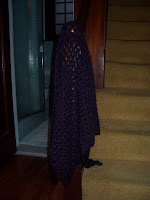 I'm pretty excited about all my crochet projects. Aside from the ill fated socks, I'm getting a real sense of accomplishment from the whole thing. Little things make me very happy.